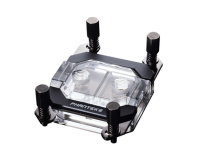 Lian Li has announced one of its few products not to be built from brushed aluminium: the CB-01 CPU Water Block, built in partnership with Overclockers UK. Positioned, naturally, as the perfect partner for Lian Li's liquid-cooling-ready cases - but compatible with any liquid cooling system you might care to name - the CB-01 marks the company's first foray into the world of first-party water-cooling creations. Built from the usual solid copper with nickel plating, the CB-01 adds a final layer of tin-cobalt to the mix for improved durability and corrosion resistance. The top, meanwhile, is made from translucent acrylic, and is drilled for aftermarket installation of 5mm LEDs if you fancy a bit of bling in your case. 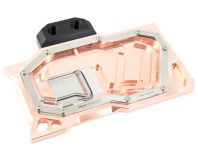 Designed for all model Intel and AMD socket types and featuring a pre-installed Intel mount with AMD mount bundled in the box, the bundle includes a spare rubber gasket, screws, nuts, tension springs and washers, plus a cubic centimetre of thermal interface material for installation purposes. A one year guarantee is included, but Lian Li has yet to confirm UK pricing and availability. 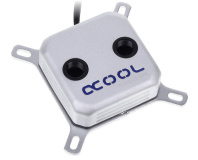 Promises quieter running, better cooling.